Funding: Highways England. 584(4/45/12)ARPS (contract with ARUP UPS), £130K. 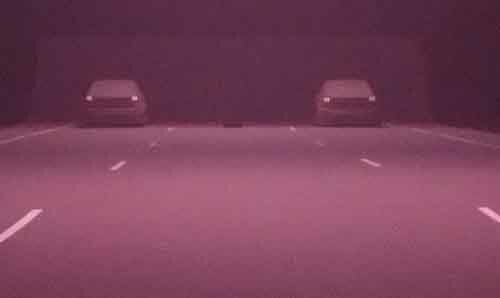 This experimental work is investigating how the ability to perform the visual tasks of driving at night is affected by (1) abrupt transitions between lit and non-lit sections of road, and (2) the interaction of fog and road lighting. 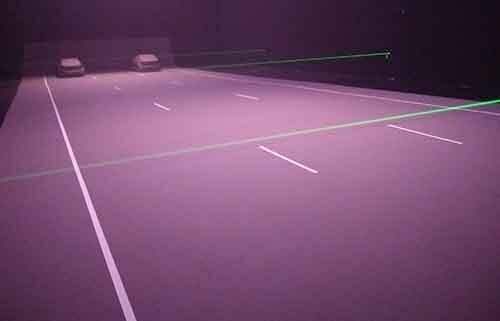 We are using a 1/10th scale model of a road to measure the reaction times and detection accuracy achieved by a sample of drivers facing representations of two scenarios occurring at night: an obstacle in the road, and nearby vehicles changing lanes without signalling. At the same time, to place these detection tasks beyond central vision, the driver performs a continuously tracking fixation task located above the road ahead, similar to a gantry sign. This motion-controlled model is mounted in a five metre lighting chamber equipped with spectrum-tunable LED lighting and a fog generator. Figure 1. Participants have a driver’s-eye view of the road through a ‘windscreen’ at one end of the chamber. These model cars have the same visual size as real cars seen from 47 metres. Figure 2. Measuring absorption coefficient of the chamber atmosphere by the attenuation of three visible laser beams. Video showing the onset of an obstacle in the road and a car changing lanes.